Lewis Hamilton cruised to victory in the Chinese Grand Prix and takes the number one spot in the championship for the first time in 2019. Lewis Hamilton had a fantastic start from second on the grid, passing his Mercedes team-mate, Valtteri Bottas, into the first corner. He never looked back and led from start to finish to win Formula 1's 1,000th race. Bottas followed him across the line for a Mercedes one-two, with Ferrari's Sebastian Vettel taking third after the team ordered team-mate Charles Leclerc to let him through early on. Ferrari's decision caused further troubles for Leclerc as Max Verstappen in the Red Bull beat him for fourth place. Leclerc was clearly upset with Ferrari's decision, saying: "But I'm pulling away," over the team radio. It's just his third race for the team and Ferrari will have to face questions about team orders and their policy to favour Vettel in 50-50 situations. Hamilton, however, will be happy with his 75th career victory after struggling in practice. He did manage to pull off a stunning qualifying lap to put him second on the grid which, ultimately, simplified his chances of taking the chequered flag. Leclerc was also quick off the start, passing Vettel at the first corner but, when Ferrari decided to let Vettel through in an attempt to challenge Mercedes, it stunted the youngster's progress. "I'm losing quite a lot of time, I don't know if you want to know or not," said the Monegasque, "Now what?" When Verstappen, trailing Leclerc by two seconds, pitted early on, Ferrari did the same with Vettel to keep him in front of the Red Bull, but let Leclerc go for another five laps before pitting him. This was to set the tone for the remaining pit stops and led to Leclerc having to chase down a 14-second deficit in the last 16 laps. Questions have been asked whether Ferrari would have protected third and fourth places better if they left the cars in their initial order and whether backing Vettel for their title assault is the right one. Finishing in sixth place was Pierre Gasly in the second Red Bull who, in a race of one, was not influenced by the strategies playing out ahead of him. He was off the pace of his teammate but was too fast for everyone else, with Renault's Daniel Ricciardo taking seventh. Force India's Sergio Perez and Alfa Romeo's Kimi Raikkonen followed Ricciardo into the points but it was Toro Rosso's Alexander Albon who stole the show, claiming the final point after starting from the pits. His car needed to be rebuilt after his huge accident in Saturday's final practice. Romain Grosjean, in his Haas, challenged Albon on the final lap but just couldn't manage to take the point. McLaren had a day to forget. Both of their cars were damaged by Toro Rosso's Daniil Kvyat on the first lap after the Russian lost control and snapped into Carlos Sainz before bouncing into Lando Norris on the outside of the track. Kvyat was given what he thought was a harsh a drive-through penalty for the incident but it made no difference as he eventually retired, as did Norris, leaving Sainz to finish 14th. With win number 75 for Hamilton, he's now the second most successful F1 driver of all time in terms of wins, but still 16 behind Michael Schumacher. "It has not been the most straightforward of weekends but what a fantastic result for the team," he said. "We arrived here not knowing how we would measure against Ferrari – they were so quick in the last race. Valtteri has been quick all weekend and to have a one-two is really special on the 1,000th Grand Prix. The start was where I could make the difference and after that it is history. The next race is in Baku in two weeks time where Ferrari could be the favourites because the very long straights that make up this hell-for-leather street track. The question is, though, is it crazy to put your money on anyone other than Mercedes? 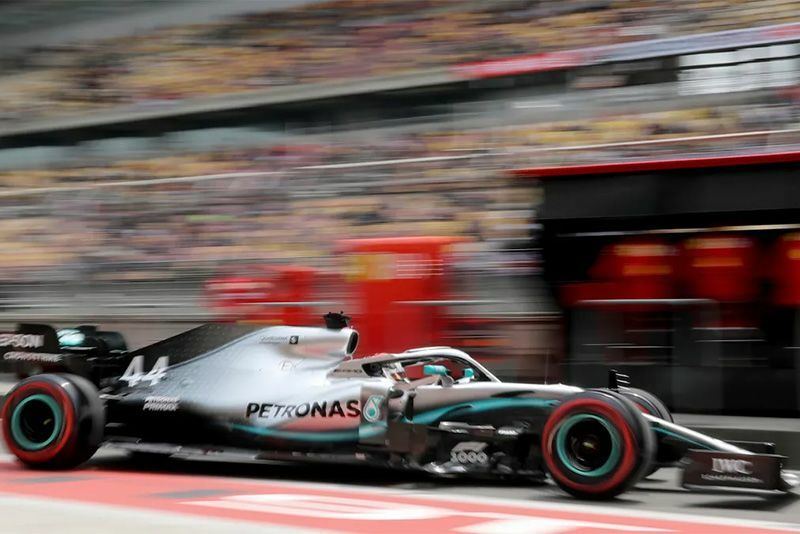 Check out the highlights from the 2019 Chinese Grand Prix here.